By Aunt Arctic-- Well isn't this a brilliant occasion. We're celebrating our 8th anniversary! If you click Happy Anniversary you can read more! Here is what it says. That's awesome! Make sure you go pick up the latest anniversary hat because this mini-party will only last until October 31st! By Rookie-- Rookie here again! It seems the transformed trick-or-treaters have found their own favorite halloween hotspots around the island. This is awesome! 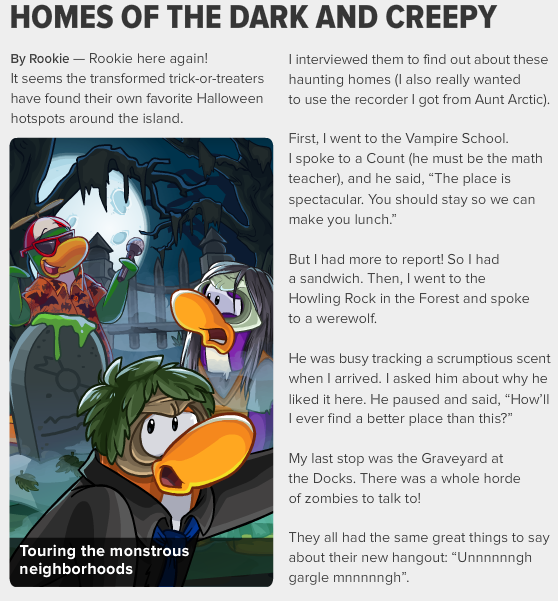 We have the Halloween Party on at the same time as the 8th Anniversary Party for Club Penguin! This is great! Also, we're going to get the new penguin style on November 7th and the new stage is coming on November 14th!